South African Safari is coming to India for a hunt. These two powerful cricket playing nations are competing for the title. I would like to offer my astrological predictions regarding outcome of the games. As usual, I will use horary system of prediction in KP. In this horoscope, the sub-lord of 6th house is Ketu. He is placed in 6th house in Saturn star and Venus sub division. 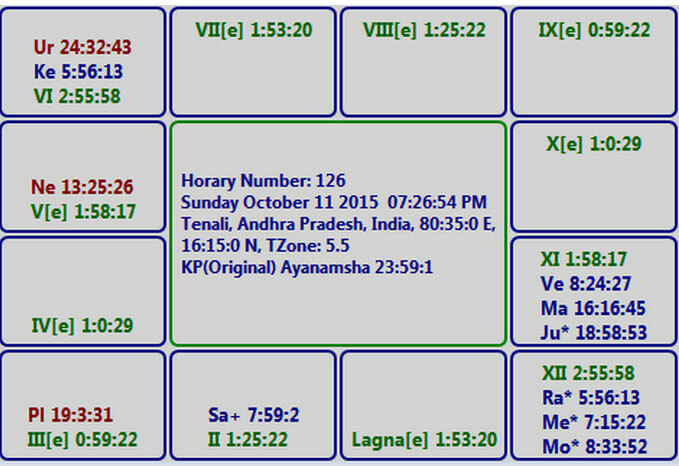 Saturn is occupant of 2nd house whereas Venus is occupant of 11th house in the star of Ketu in 6th house. Therefore, Ketu will become powerful significator for 2, 4, 5, 6, and 11 houses. The combination of these 3 houses is promising success for India. According to my analysis, this game will be in favour of India. This may be a tough game, but ultimately success will be with India. Best wishes for both the teams. Good luck!